There’s a lot of talk in the world about the media and how they sensationalize stories to invoke greater emotion, be it fear or joy (but mostly fear). I think overall as a society we’re all to jumping on the bandwagon. Case in point, a friend posted a link to a Gawker.com article the other day on Facebook. 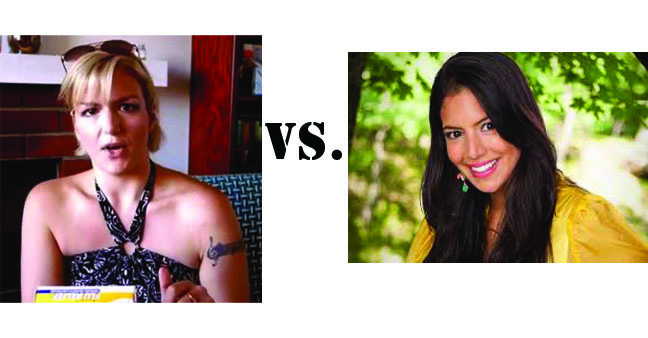 In it, a fairly new to the scene blogger Yvette Guinevere, nicknamed the “Science Babe” is calling out a very popular health blogger Vani Hari, aka the “Food Babe”. She rails against Hari for overstating dangers in everything from bread to airplanes to Starbucks lattes (which seem to be the straw that broke the proverbial back for this Science Babe and set her on her path to “debunk” Hari). The only difference between the two is their point of view. Hari is challenging us to think twice before relying solely on the word of agencies like the FDA and companies like Monsanto. To Guinevere, these agencies are completely trustworthy and we should trust science to the exclusion of all else. While Guinevere has a point, she’s also as guilty as Hari of sensational claims. She just uses more sarcasm… But apparently that’s ok since she’s “right”. Right off the bat “Science Babe” seems to be almost willfully exaggerating the claims, or willfully manipulating the statements to make them seem ridiculous. She bashes the use of “toxic” when talking about sugar, stating that “anything can be poisonous depending on the dose…” Even water. She’s missing the point, here, though. One of the problems with the Standard American Diet today is that we’re way over-dosed on “safe” ingredients and chemicals. We haven’t had enough time (or science) to show what the cocktail of additives and volumes and storage of these things over time will truly do to our health, although we have some ideas. And speaking of chemicals, Guinevere goes on to complain that everything is a chemical, even water. Well, duh, we’ve all taken chemistry… The point here again is that it’s not so much nature’s chemicals that Food Babe is warning us about. It’s the man made ones. But it seems that Science Babe is happy to oversimplify the point yet again in her effort to make Hari look like an idiot. I could go on and on, but I think you get the point. To Guinevere, science is king and she seems to be ignoring a growing body of evidence (and a growing body of science) that indicate that our health, and even our genes, are influenced by our diet and lifestyle. Just look to the Gerson Institute where they’re curing incurable cancers with organics and juicing, or Super Size Me or the upcoming Sugar Film. I’m not saying science is bad, or even that medicine is bad. I’m just asking you to think critically before blindly following either blogger. Use your own judgement. Wake Up and Think for yourself! Thoughts? Comments? Hate mail? Leave ’em in the comments below.